Well it has finally happened, PlayfulCO has moved up in the world from the "greedy, lying, misinformation" company into the "censorship, theocracy (where they are the Gods), and terrorist” company. What better day for them to transition than on Sept 11th? What better day? Gamers everywhere, if you support this game you are not only supporting a downright evil company, you are the cause of the downfall that is video gaming. You need to pull your heads out of your butts and start opening your eyes. If you support these companies and these business practices you are the cause of the “Early Access” problems, the cause of “PTW/PTP/PTC” problems, and the cause of video game companies having the right to stifle freedom of information with censorship. You ARE the cause of gaming review companies, personalities, and publications going the way of the “sell out”, and why? Because if they don’t “sell out” they are “snuffed out”. So what happened? 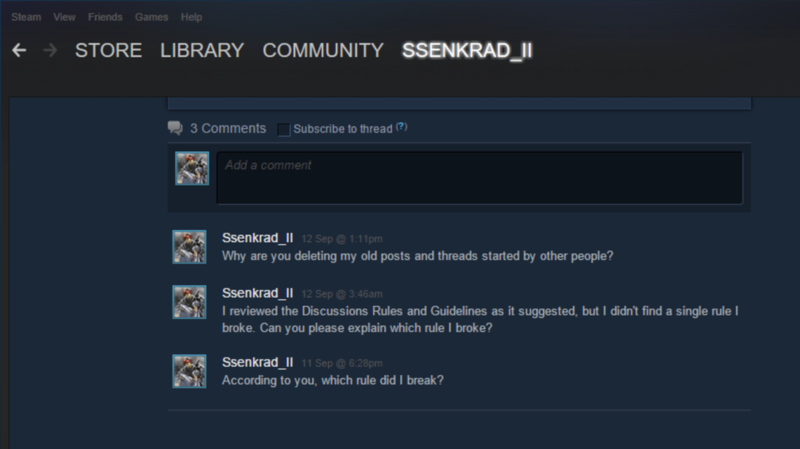 Someone (Will have to censor screenshots as to not get myself in trouble with Steam) whose first language is French, had a problem. You see he bought the game because it says “solo play” in the description and bought the game in a bundle and now finds out that the game is “online only”. He asked for help and doesn’t understand why the game can’t be played offline. I post a comment (in English and then I took the time to translate it into French for him) explaining how the game is going the FTP micro transactions *(PTW/PTP/PTC) route and that is why it will never be offline. I also tell him that he should have read reviews before buying said game (hoping that he would do so in the future but also because some of us take the time out of our lives to try and help other gamers, the least you could do is read it and inform yourself). He then thanks me, first for taking the time to respond, second because I translated it into French for him to easily understand, and third for answering his question. What happens next? Enter Fan Boi (let’s call him “Bent”) Bent, he wants to turn the thread into how the game isn’t a PTW/PTP/PTC game, basically giving the middle finger to the person with the problem, and then reports me. 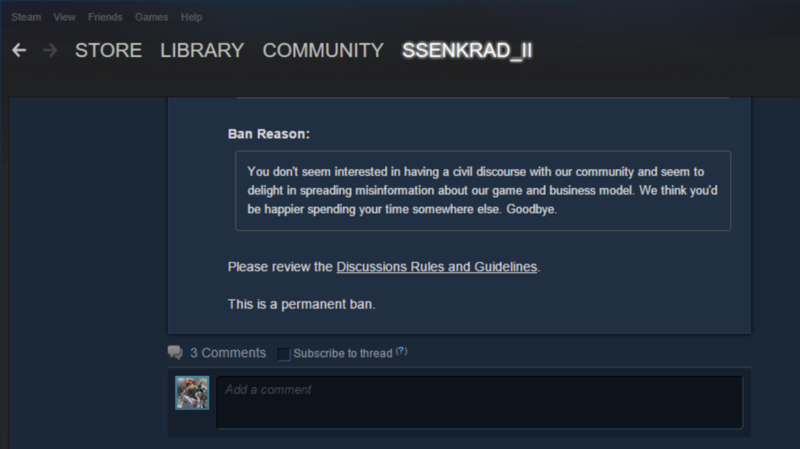 I also asked them back in September 2015 which rule from the Discussions Rules and Guidelines did I break to cause a permanent ban without so much as a warning. To this day (November 12 2015) I haven't received a response. Please feel free to read my older reviews for this game on my blog, check out all of my postings in the Sell-a-verse forums, please read that thread above (if they haven’t killed it) and you tell me if I have not been civil, if I have not been doing anything but spreading simple truths. I would be happier spending my time somewhere else, and I shall. More importantly, gamers, so should you. This sort of “people in power quelling people’s voices just because they don’t like what they are saying”, THAT is the death of gaming as we know it, THAT is the death of honest game reviewers as we know it, that SHOULD be the death of early access! Who is going to give an honest review when they get censored? Who is going to give an honest review when they will never be given early copies of games and/or have to buy every single one of the games they review? When companies start censoring conversations that scare them and then only give access to those that will say what they want to say what do you have left? In my last review (which you can find on my blog) I pointed out that a lot of the reviews had tags/titles that read “reviewed with key sent by developers”, since that time they have all removed that tag. Every, single, one of those “given free keys” (hundreds of these reviews on Steam) was “positive”. And I have done so civilly and with facts. Bottom line is this, you want to buy into early access and support this game YOU are the problem with gaming. And how does Steam respond? By putting reviews that get 50%, 69%, and 70% “found helpful” in the “most helpful” section because they are all “positive” reviews when all of the negative reviews are much, much higher. Tell me this isn’t censorship? Tell me this isn’t “buying away all the negative reviews so no one ever sees them…” If you have a brain, or if you care about gaming in the slightest, do NOT support this game/company or any like it. Look, you can’t read because it will fry your brain but honestly want to know what this game is about, then go to Playfulcorp.com/candycraft2 and see for yourself. Honestly don’t know how long that will continue to be up on their website before they take it down, it is a PR nightmare. ***Older reviews of this game in their completeness can be found on my blog; address found on my Steam profile or by googling Ashley and Micah English. Q: Why change the review? A: Getting way too many people with far too little brain power commenting on this review purely because they can’t take the time to even read the review, let alone the comments (now over 100). Hoping that this will help. Q. What is this game, said in less than ten words? A. This is a pay to play Minecraft with less content. Q. Whaaaaaaaat? You have over ___ hours in game? WTF MAN!? You dig down and find some diamonds and have to put an extractor on said diamonds before you can even get them into your inventory- extractor takes at least 15 minutes before it is done getting your diamonds. [You used to be able to pay real money to speed any timer process up, currently the option is ‘turned off’ for EA for obvious PR reasons] Once you get your diamonds, is that enough? Nope... Got to put raw diamonds into your furnace to get diamond blocks- furnace takes at least an hour to pump out all your blocks. Once you got your blocks is that enough? Nope, got to put the block into a processor to get diamond slabs, another hour passes. Enough? Nope, got to put those slabs into processor to get diamond rods, another hour passes. Now you have all you need to make yourself a single diamond sword, HELL YEAH! Twenty swings later your diamond sword breaks, permanently, no repairing it, it is GONE after a VERY limited amount of uses and you have to do the whole process over again if you want another diamond sword (That is, if you are lucky enough to find more diamonds fast enough). The deeper you go the rarer the material is to find and the longer each step takes to extract, furnace, and processor. Q. But I heard that the in game store and paying to speed up timers were taken away from the game, what are you talking about? A. The store has been taken down for EA [for obvious PR reasons] but the dev’s are crystal clear on telling people that it will be returning, when is a matter of timing. You can no longer pay to speed up your timers, but the timers and entire system described above is still in the game, in fact they have now added a “forge need fuel” system into the game which means that in order to even use the forge you will need even more items to burn through. The mechanic is turned off for obvious PR reasons but the gameplay is still not only there, but they are adding more and more layers to the system; it is as simple as just “turning it back on” when the time is right. Q. What will be offered in the in game store? A. Recipes for crafting items to build, such as ‘stain glass windows’. ie. pay to play in a building game. Q. 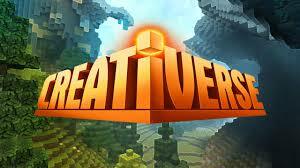 What are the biggest problems facing Creativerse? Q. In what ways does PTP ruin gameplay and features? A. This one kills me because people just don’t take the time to figure this out, or frankly care. PTP bleeds the fun’ out of playing a game, as I described in above question, but also in fundamentals- where is the fun in spelunking for recipes and treasure if the better items are just sold? (Remember Diablo III, this is it in Minecraft form) But not only that, features that appear in other similar games will not appear in a PTP/PTW game, as a PTP/PTW game (League of Legends,Diablo III, Hearthstone, etc) always need to be connected to the internet. Q. What are a couple of obvious features that are missing from all PTP/PTW games? 1. Mods; there will never be mods in a PTP/PTW game, PERIOD. For if you could just ‘mod’ items into the game, why would you ever pay for them? Mods will never be allowed, PERIOD. 2. Single player (offline mode); there will never be a single player offline mode, stop asking for it. If you could play the game offline then it would make hacking, and thus modding the game a possibility. And since the game is free, people would be getting basically a free game. S.P.O.M. will never happen, PERIOD. 4. Reasonable PvP; you immediately become a pay to win as soon as you implement PvP in any degree. Look to any FTP game with PvP as an example, they are all PTW- LoL, HearthStone, etc are all the same. Picture a Call of Duty game where the online was based around buying (with real money) weapons and gear- would anyone with a brain claim that wasn’t pay to win? Once everyone has bought all there is to buy, sure, everyone is on equal footing, but to get to that point (to be able to actually win) you will have to fork out some money, and thus become a pay to win. Q. In what ways are the community toxic and the dev’s supporting that toxicity? A. Simply put if you bring up Minecraft, Terraria, or any other similar game for any reason other than to say the sucked, you will be attacked, viciously. Dev’s then will come into the thread and fuel the fan boi’s (ie. “Oh yeah Duster2007, I am totally with you on that one! See you building!”) and not even attempt to bring civility to criticism. If you try to bring up the pay to play features in the game fan boi’s will attack, dev’s will pat them on the back- rinse and repeat. If you really don’t believe me check out the threads (many have already done so by my request and many have posted comments in my review confirming this, much to their shock) and find out for yourself. Q. Why are there so many positive reviews for this game? A. This is an important one as well, and my last point for now, simply put Playful CO has admitted (and so have many people that have given reviews) to giving out free copies of the game to friends, family, and others who then will turn around and post positive reviews as soon as they install the game. Some have played the game for as little as a half an hour before posting a review. I can’t prove that Playful CO gave them the free copies on the promise of them posting a positive review, but any serious gamer wouldn’t need me to prove that. I am sure that after reading this review Playful CO will ask those people to remove that information from their reviews, but currently as of 5/31/2015 on many reviews you can read “This game was reviewed using a code sent by the developer” or something similar. -A game that is playable but full of pay to win/play/continue whatever you feel like calling it built into the gameplay and mechanics. Some pay to play features are turned off, but if something confuses you in game and you wonder "why is that?" ask yourself, "could they charge money to fix that problem?" and you'll have your answer... It's as easy as just 'turning it back on' when the time is right, and when you ask the dev's about it they are very clear that the store will be coming back; so saying they are not there currently in game is a half truth as they are just currently 'hiding it'. -A game that what you buy now in early access will most likely be what you get when game launches, any new content (such as stained glass and a slew of other building obects) will be for sale at the store... Yeah, if you want to build in this building for free game it will cost you... But it isn't pay to play! I swear! -If you have money and don't know what to do with all of it, this game will help you! -What you see is what you get, the hogwash being thrown around like 'your voice matters' and 'they actually change the game based on critique' is really not happening- fan boi's make sure of that and dev's let them. Sure, if you want to throw in an idea for a brick? Absolutely they want to hear that, they can sell it! -Huge two faced community, over the top fake friendly on the one hand and trained feral wolves on the other. If you think something is broken, keep it to yourself. -Serious lack of content... If you are coming from Terraria, or even Minecraft, you will find yourself in an empty world. But it is early access, that will change! Maybe... But most of the dev's time is clearly spent trying to 'fine tune' their pay to play mechanics and bricks they plan on selling you and not on actual content. -Currently online only on their homemade servers; further putting up the red flags that you have a dev CO that wants all the $$$. Could this game be worth playing at launch? No doubt about it... But is there any reason for you to pay now just to give them ideas on what they can sell back to you in the future? Is the early access worth the money? No... Don't waste the time and/or the support, there are other indie companies that would die for your support and are actually trying to add real content to their games; not just pay to continue, or artificially inflating gameplay time, or riddle the game with 'slow downs!'. And if you think you can come in and change anyones mind, that you could save this game and help it become bigger and better than Minecraft; think again, fan boi's will attack and insist the game is in perfect working condition. I beg you gaming community, don't support pay to play games and ruin gaming forever; let these games change or die. Currently there is no control over the trolls in the community (on the threads or grief in game; as such myself and my friends have left the community worlds as well as unsub'd from all the threads) and the game has way too many stop blocks put into place to take money (currently it is centered at and around the 'obsidian level', where the best lights, extractors, ect are all made with obsidian) where everything degrades and you are forced to rebuild and search for new minerals to farm to build the same item again, etc etc etc; anyone who is familiar at all with the pay to win/play games and has half a brain can see the writing all over the walls of this game. If the game direction changes and if the dev's get control of their own community (in game and out of game), things could change; but in its current state and direction of pay to play, the gaming community needs to step up and let these games die or watch as gaming as we know it dies.